【2 in 1 Design】This is a two-in-one warm pet sleeping bag - can be folded as a cat's house and be spread out as a pet's blanket. 【Furry Material】 side brings extreme comfort, and polyester material side for easy-clean. 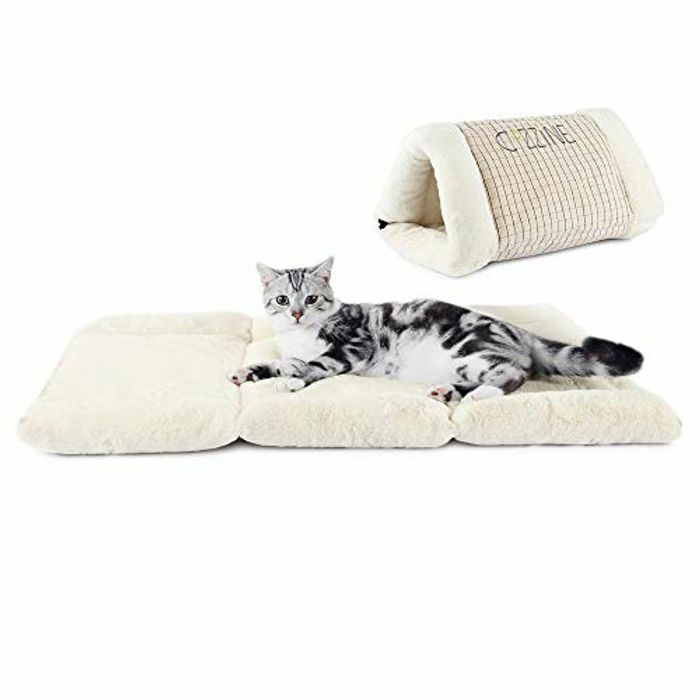 Soft and warm, a perfect cozy bed for your pets. 【Rustling Paper】Featured with rustling paper inside to add fun for your cat. As we all know, cats love objects with rustling sound. Just imagine your cat scratching, scratching, and circling happily on the mat. 【Application】Suitable for most pets, great for dogs and cats. Convenient for anywhere, such as sofa, bed, living room, balcony, bay window, garden, pet crate or cage etc. Perfect for sunbathing mat, nap and sleeping bed.